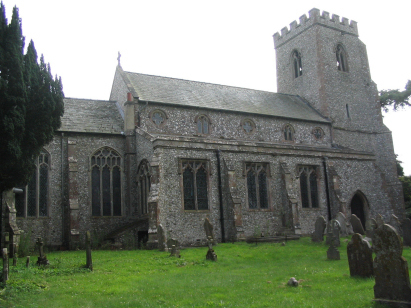 The parish of Ingoldisthorpe lies in western Norfolk on its coastline with The Wash and about 10 miles north of the port of King's Lynn. Ingoldisthorpe is a relatively small neighbour to the larger villages of Dersingham & Snettisham, all 3 lying on the former route of the A149 which connects King's Lynn with Hunstanton and Norfolk's north coast. Ingoldisthorpe, like the other two, keeps its feet dry sitting just off the coastal grazing marshes that front The Wash - these marshes stretch for over 2 miles west of the A149. Despite its coastal location Ingoldisthorpe was essentially a farming community at the time of this transcript, it was almost equally split between arable & pastoral farming, the former on drier ground rising to the east, the latter on the coastal fringe to the west. The lack of a harbour made marine employment limited to the collection of shellfish from the mud. Today the two larger villages have almost spread out to merge with Ingoldisthorpe and all 3 are commuter settlements for King's Lynn with many modern estates growing up. It is tucked away within one of those modern developments that you find St Michael's church. Contrary to the statement of redundancy in Pevsner this is still very much an active consecrated church. The majority of the building is in the Decorated style, only chancel and clerestory being Perpendicular and slightly later. 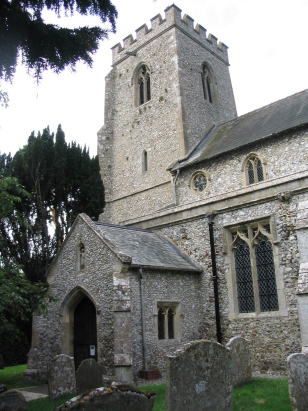 The building makes extensive use of flint, many churches in this area use the umber-coloured carrstone so its greyness stands out. Like many churches the building was renovated in the Victorian era, in this case in the 1850s. Unlike many this renovation was done sensitively and some would say the stained glass added at that time has enhanced the building. The church is best accessed from the road to Shernborne where a blue sign indicates the footpath leading to the site. There are quite a few trees around the churchyard so photographic angles are impeded somewhat. A single standard 800-entry register book covers the period of this transcript and runs onwards to complete in 1886. This register is filmed on Microfilm MF1420 in the collection of Norfolk Record Office which was used to prepare this transcript. Whilst the register is, at times, a little irregular with entries out of date sequence and strange spellings, in particular. The standard of image and handwriting was generally not an issue and it was thus a straightforward piece to prepare.